Produced between 1920 and 1949, the Indian Scout rivalled the Chief as Indian’s most important model. Lean, economical and powerful to boot, the Scout proved exceedingly versatile and captured the design mood of the day where function and form were demanded in equal parts. 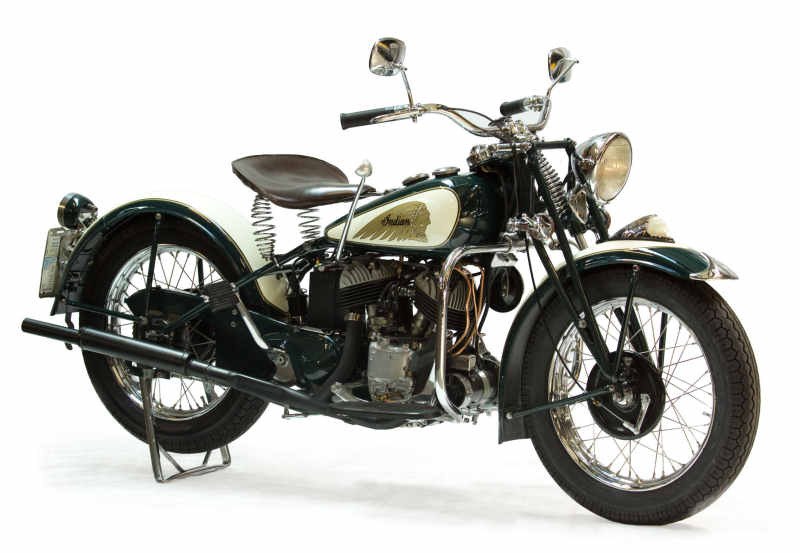 However, by 1932, the depression was taking its toll and cost-cutting led to Indian designing a new basic frame for 1932 that would form the basis for the Scout, Chief and Four frames. The 1932 Standard Scout, which was based on this new frame, was stronger but heavier than was the previous model with the 101 frame and was less competitive. As a result, the negative reaction to this Scout led to the creation of the Sport Scout of 1934 which offered a light frame, girder forks, improved carburation and alloy cylinder heads. In 1937, the Sport Scout won the first Daytona 200. Ironically, the bulletproof design of the Indian Scout meant it was consigned, by popular demand, to frontline action during WWII. The most common military version was known as the 741, which was its VIN designation. This immaculate example has been rebuilt from the ground up with the engine being completed by BC Motorcycles in Papakura. All parts of this machine are original or were directly patterned as required. It has been converted to 12 volt for modern conditions. Revitalised to reflect the Scout’s true pre-war colours, this Scout is a wonderful example of the very best of US design – elegant, robust and Indian.